As will be obvious to those who know me (and as will quickly become very obvious from this blog, if not obvious already), I have a deep affection for things that are a bit ‘rough around the edges’ – as much as I like the ‘art on a plate’ presented to us at the Bottle Apostle, I much prefer rustic looking dishes when I cook or bake (well, a bit of rustic interspersed with some gold-sprayed fondant …). Although this is partly due to a lack of artistic talent (and lack of patience), I do think that there is something beautiful and comforting about a misshaped pizza, the haphazard scattering of fresh berries over some freshly cooked pancakes or indeed a pie baked without a pie dish (and being called ‘galette’ – how French and fancy!). When I started coming across more and more recipes for ‘galettes’ I was euphoric – despite Jamie Oliver teaching us that the easiest way to line a baking dish with dough is to cut thin slices off your ball-shaped dough, use these to cover the baking dish (including the sides) and then use your fingers/a mini rolling pin to create an even surface (making sure there are no holes in the dough), the idea of simply rolling out your dough on some parchment paper, with no shape or form, and partly folding the rim over the filling immediately appealed to me. The recipe I used came from <;;a href=”http://http://www.bonappetit.com/recipes/2011/05/rhubarb-and-raspberry-crostata#ixzz1yoHciGDZ“>;;Bon Appetit (and Bon Appetit actually calls this a crostata – I am still going to call this a galette – the girl in me with the Italian boyfriend thinks a crostata is something else entirely – a crumbly flat cake, covered in jam or, even better, Nutella, with an additional layer of pastry strips on top (almost like a lattice pie I guess)). Bon Appetit’s recipe was for a rhubarb and raspberry filling. However, I am not the biggest fan of rhubarb (though it has started to grown on me more and more and I can now certainly tolerate it) and I think cooked (or baked) raspberries are overrated. 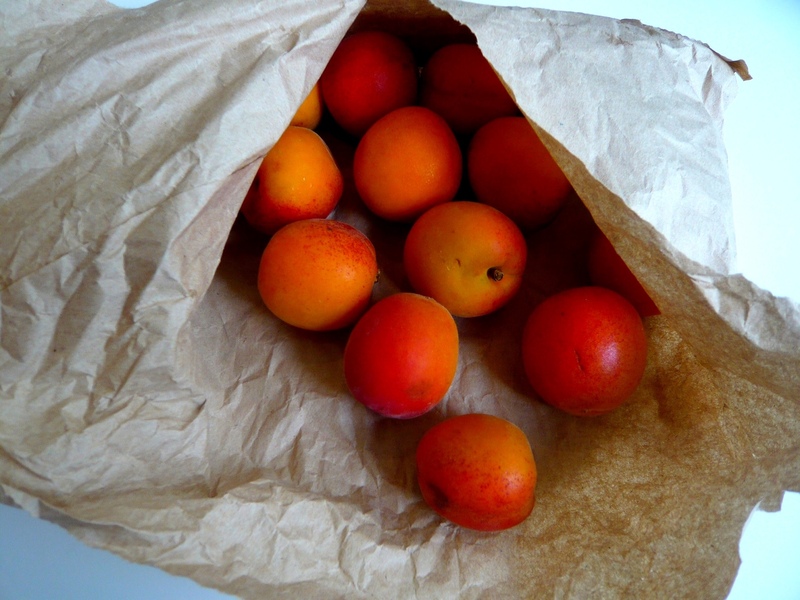 Besides, when I went food shopping on the weekend I came across these really cute little apricots with a slight pink hue. Also, I have been meaning to use up some marzipan that has been sitting in my fridge for too long and I had been meaning to try out whether marzipan could be used to substitute the sugar/almond mix in frangipane (people, it can, and it’s great), so I figured that having poached apricots sit on a bed of frangipane in a wholemeal galette was probably a very good idea. And indeed it was. This recipe will make one generous big galette, enough to feed 6-8 people. I ended up following the suggested amounts but only baking 1 small galette (enough for a small dessert for four of us plus breakfast this morning (yum!) and likely breakfast tomorrow morning as well (yum again). The other half of the dough will likely be tuirned into 4 mini tartes with cherries and/or blueberries – will need to do that soon though before the frangipane goes off). I used wholemeal strong bread flour – because that is what I had. And yes, it is a lot coarser than other types of wholemeal but it certainly fit the ‘rustic’/’rough around the edges’ theme I was going for and gave the otherwise flaky and buttery dough a bit of bite. 1. Start by making the crust, which can be made several days in advance, but should, as a minimum, be made 2 hours in advance of baking as the dough needs to rest in the fridge. 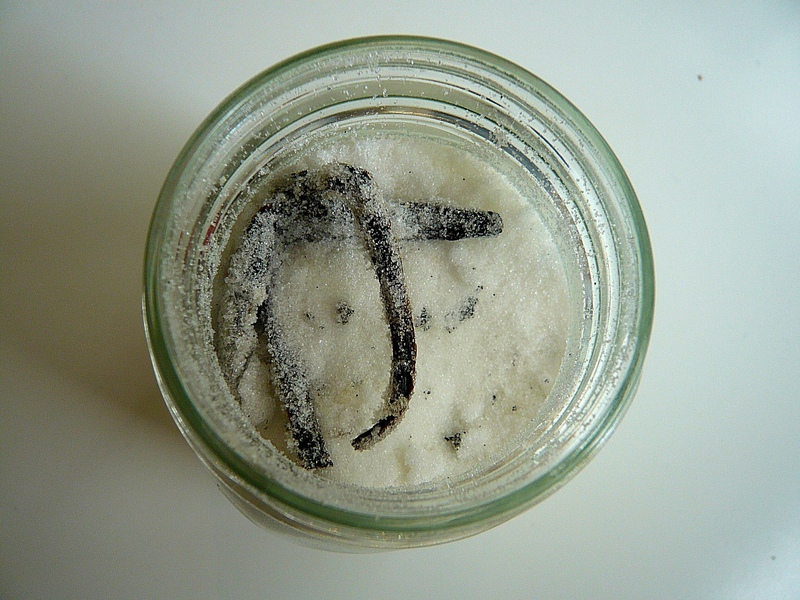 To make the crust, combine the 2 types of flour and the salt in a food processor. Add the cubed butter and process the mix until a crumbly dough starts to form. Mix the milk with the egg and add to the processor. Process again until the dough starts coming together. Shape dough into ball, flatten into a disk, wrap in clingfilm and let rest in the fridge for at least 2 hours. The key here is to make sure all the ingredients (especially the butter) are nice and cold and that you work quickly – to ensure the dough is ‘short’, crisp and crumbly you need to work the dough as little as possible – the more you work the dough, the more the gluten in the flour is activated which will turn the dough into a chewy mess (and no one wants a chewy galette!). 2. For the frangipane, crumble the marzipan into your food processor, add the melted butter, flour and your egg and process until the mixture is smooth. 3. Pre-heat your oven to 190 degrees Celsius. 4. 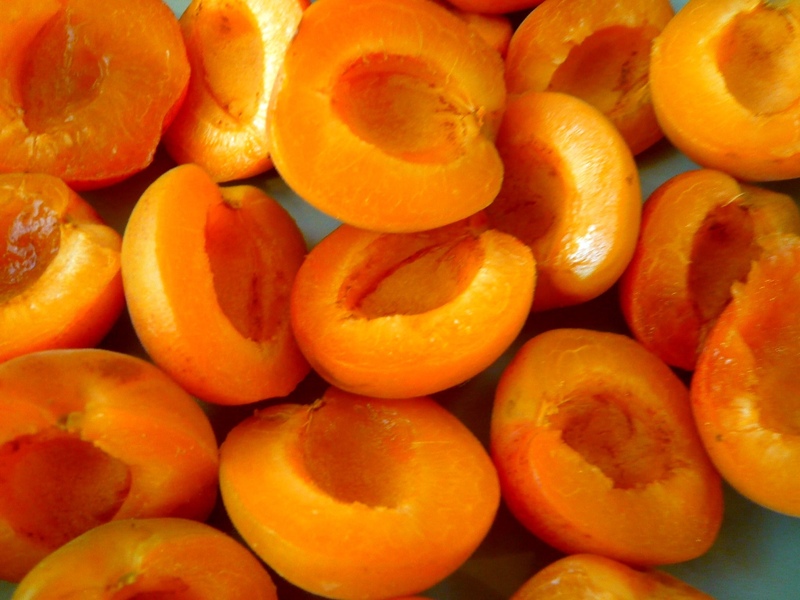 Combine the apricots, the water and the vanilla sugar in a bowl and simmer on medium heat until the apricots start to soften. 5. You can obviously bake this in a pie dish, but I much prefer the rustic look of the galette. For the galette, all you need to do is roll out your dough disk between some parchment paper until about 1/2 cm thick. Spread your frangipane over the dough, leaving ca. 1cm free around the edge of the dough. 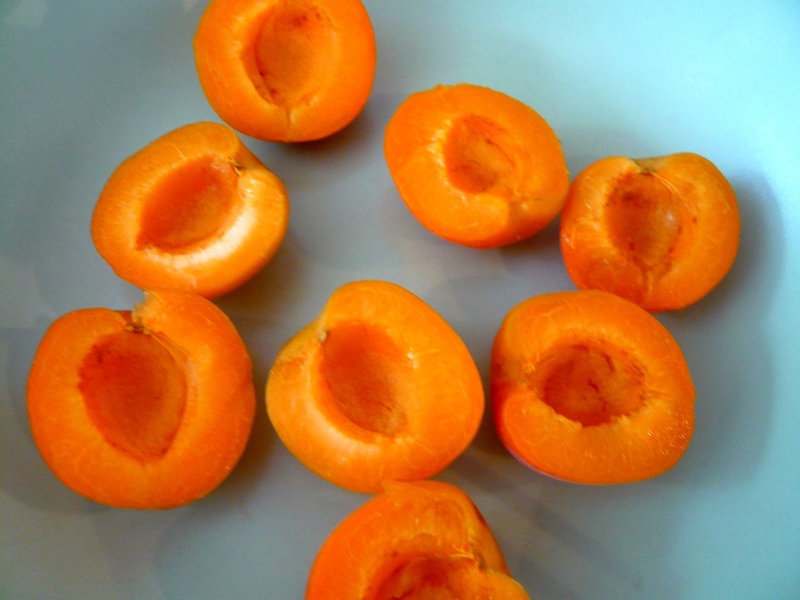 Place your apricots on the frangipane and gently fold in the edges of your piecrust (as the apricots will release their juices during baking, you want some form of barrier to stop all that good stuff leaking off your dough!). Sprinkle some extra vanilla sugar on top (but go easy on the vanilla sugar – as we all know, sugar can burn very quickly – well, I learned this lesson again – not only does my oven clearly have some ‘hotspots’ (and not in the wifi kinda way) but I was clearly a bit heavy-handed with the sugar in some parts resulting in a few apricots that were a bit charred on the sides – something that clearly fits with the ‘rustic’ theme but was wholly unintentional (and did annoy me a fair bit)). 6. Bake your galette for ca. 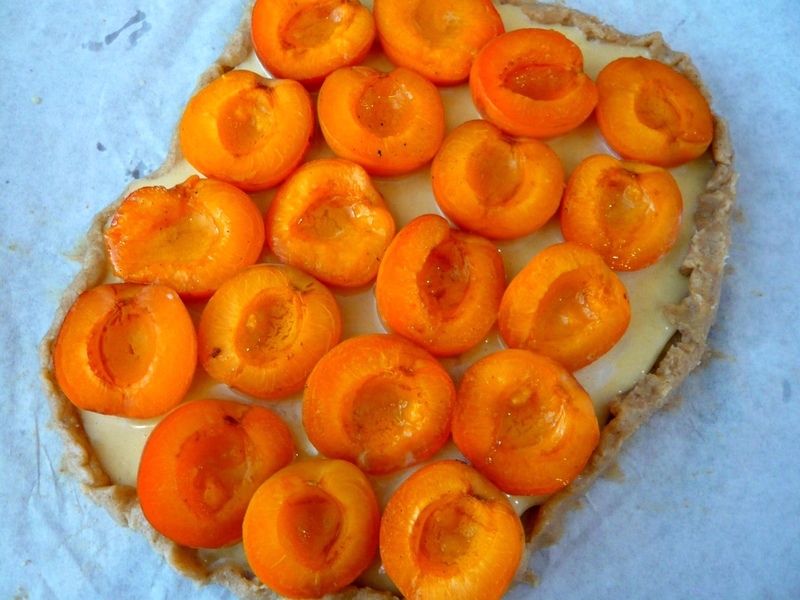 45 minutes or until the frangipane filling has bubbled up between the apricots and the crust is golden. 7. Ideally served fresh out of the oven with a scoop of ice cream (I am thinking creme fraiche ice cream would be good – something cool and refreshing to contrast the hopefully still warm galette: dairy flavours pair well with stone fruits like apricots and the slight tang of the creme fraiche would contrast nicely with the sweet frangipane filling and the buttery slightly salty galette)! Oh and if you happen to have some poached apricots left over and haven’t gobbled them all up while making your galette, I found out that they do make an excellent topping for a somewhat unorthodox breakfast of sweet semolina (made with half milk / half the leftover poaching liquid – what can I say, nothing is wasted in this kitchen! ).